310-SIGN located in Canada and we focus on the production of Safety Signs & Labels, Traffic Signs and Oilfield Signs. We produce signs in Alberta and we stock a variety safety supplies & sign post hardware in our Canadian warehouse. We have shipped signs across Canada and the USA but our primary market is BC, Alberta and Saskatchewan. We make signs for major oil producers such as Husky Energy, Pengrowth, Cenovus Energy, CNRL, MEG Energy and more, and we have set the standard for several plants including commissioning safety signs for entire facilities. We also provide provincial highway traffic signs & work zone construction signs to road builders, utility construction, cities, towns, municipalities and counties across Western Canada. Safety is our #1 focus. Our team is lean and agile and we pride ourselves on remaining current with new standards and regulations. In terms of oilfield signs, we have put a significant effort into understanding all requirements set by AER (Alberta Energy Regulator) so that our pipeline signs and wellsite sign (also known as oilfield lease signs) meet or exceeds expectations. Although safety is our #1 focus, we understand that the oil & gas industry never sleeps and always needs thier products quickly! Our manufacturing process implements lean-six-sigma methodologies so that we can process sign orders well above the industry norm for delivery. Being an Alberta based sign company we also offer Traffic Signs manufactered to meet 2014 5th Edition MUTCDC (Manual of Uniform Traffic Control Devices for Canada). We are able to produce signs that meet all regulatory and provincial standard traffic signs as authorized by the Government of Alberta Ministry of Transportation and the Saskatchewan Ministry of Highways & Infrastructure. Our signs meet all ASTM specifications. 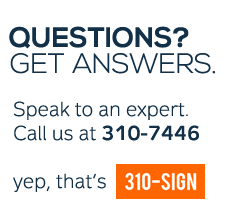 310-SIGN offers traffic rentals for electronic message boards, speed radar trailers, work zone signs, barricades and other traffic control devices. If you need custom safety signs for your workplace or facility we have a wide range of stock safety signs to meet your needs, or we can produce custom signs quickly. Our signs are ANSI/ISO compliant and they are made in Canada to endure tough canadian winters and harsh work environments. We stock over 45 safety signs such as First Aid Kit, PPE Signs, Construction Signs, H2S Gas Signs, Open Excavation Signs, Pipemarking Labels, 5S/Lean Signs and more. We also carry all of the hardware you'll need such as u-channel sign posts, sign mounting brackets, sign post pounders and sign frames. "We understand your needs, because that's our job."